The ZXS series of shredders are built tough for high throughputs & demanding applications. Standard shredders having rotor widths of 1,500mm through 3,000mm use 750mm diameter cutting rotors. ZXS shredders are well suited to size reduction of a range of materials from voluminous tanks to solid purgings. A large rotor diameter in combination with slow rotational speed ensures smooth operation. Easy access doors combined with an optional hydraulically actuated screen cradle ensure easy access for maintenance & cleaning. Throughputs up to 10,000 kg/hr can be expected. ZXS shredders are equipped with a hydraulic feeding system. The heavy duty swinging ram is equipped with heavy duty bearings & supports. The swinging ram is equipped with a serrated ram plate to minimise slippage when shredding bulky items such as bundles, lumps or pallets. To eliminate material build up between the pusher & cutting chamber, the pusher is equipped with scrapers. The hydraulically operated ram forces material against the rotor & in the event there is an overload situation, the ram will stop & then move backwards to release pressure on the rotor. The ram then automatically reverts to the forward pushing motion & in this way throughput is optimised. The special swing ram design eliminates the need for guide rails inside the cutting chamber, reducing wear & the risk of the pusher jamming. The swinging ram design also reduces the footprint of the machine. Standard shredders are equipped with two speed hydraulic systems allowing the ram to move faster in a no load situation. 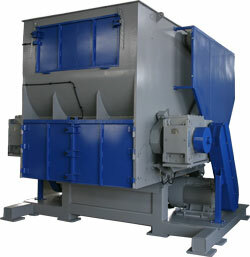 ZXS shredders are an integral part of any recycling system. In feed & out feed conveyors are available on request.